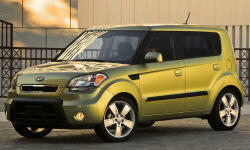 Kia Soul Pros and Cons | Page 1 of 2 | Why Not This Car? What drives people to buy (or not buy) a certain car? TrueDelta's members share Kia Soul pros and cons based on their real-world driving experiences. I researched this car heavily before purchasing. Consumer Reports gave it a 74 out of a 100 and gave high marks for reliability. 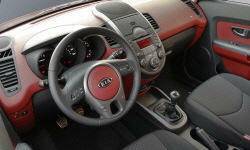 I went on KIA forums and asked owners many questions before deciding to purchase this car. 2014 kia soul + versus 2012 kia soul +......NOT an improvement. Kia improved the suspension on the 2014 model, an improvement that was sorely needed. The revised suspension handles potholes, bumps, and pavement joints much better than the previous version. Wheel locks not needed...Along with the $350 rear view mirror, profit center! Comfort for four American-sized humans; room for a little luggage; pretty much any common option you could want (minus maybe heated seats and mirrors); distinctive styling; and very good fit and finish for around $16,000? Yes, please. I find the car visually appealing. Included safety features as standard. Smooth and sure brakes. Outside mirrors leave no blind spots. Crash tests results are great. My insurance went down. Comfortable driving position. Convenient control locations. Good fit and finish throughout in the ! model. Tons of headroom. My daughter has lots of visibility in the back while in her car seat. Full size adults can sit back there in comfort. Comfort of an intermediate-size car, with everything in easy reach. Able to maintain comfortable safety belt adjustment. Tons of standard features! MP3 hookup and bluetooth...satelite radio, good audio system...good stuff. When entering onto an Interstate and hitting the gas the car picks up quickly and is easy to integrate with the traffic flow. The reviews I have read and the actual driving experience.